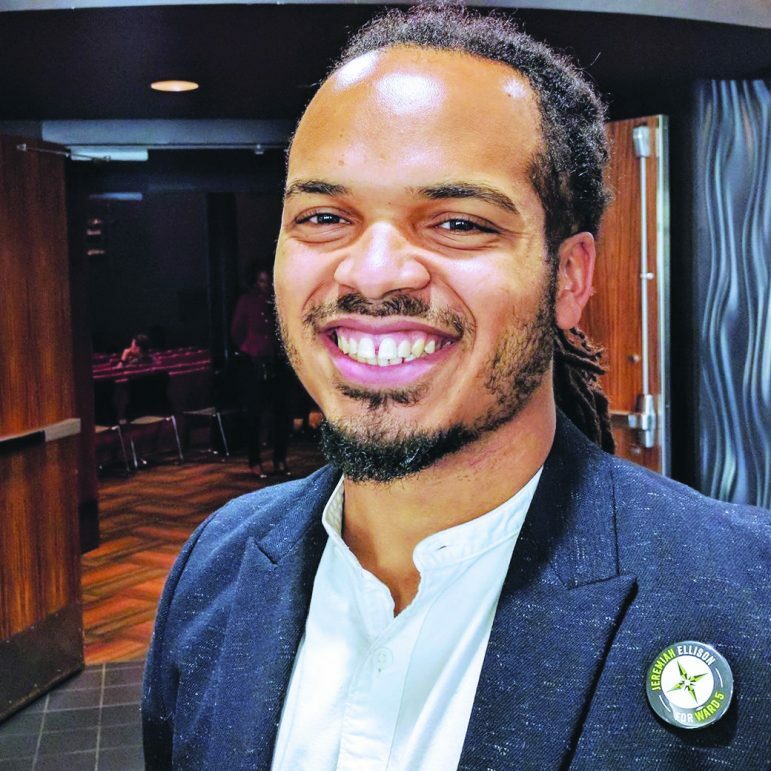 In the middle of Jeremiah Ellison’s time with Creative CityMaking Minneapolis, a collaboration between local artists and the Minneapolis city government to promote city priorities, Jamal Clark was shot on the North Side. The lack of response by local leadership at the protests lit a fire under Ellison, which eventually led to his successful run for the Ward 5 city council seat. When running for office, Ellison said he made it a point to ensure his campaign wasn’t about him. “That was probably my biggest reluctance [for running], because campaigns can be so candidate-specific and they can be so personality-driven, and I really wanted to stay away from that,” he said. Ellison said he and Phillipe Cunningham (Ward 4) normally would not have been considered electable in an election on the North Side. “We’re both Black. Phillipe’s trans. I don’t have a college degree. In a typical election, we’d be written off as unelectable.” The fact that both were able to win against incumbents was very inspiring, Ellison said. Science fiction will play a big role in how Ellison operates in his city council seat, he said. He explained that he views science fiction as a projection of the future that comes from the mind of the creator. As a creator, Ellison said, “I want to envision a world in which gender violence doesn’t exist, or in which racism doesn’t exist, or in which wealth disparity doesn’t exist.” Then, once you have this vision, you can insert pragmatism and implementation, he said. The artist in Ellison understands the importance of creativity in problem-solving. “We’ve got to be equally creative and visionary of how we’re projecting the future,” he said. “Especially if you want to push back against what has been the trajectory, which is an increase in wealth disparity, which is a persistence of race-based segregation… It’s going to take some vision and some creativity to reverse some of the harms done,” he added. One of the focuses during Ellison’s time in office will be stimulating the economy in his ward. He wants to invest in what he called the “baked-in sense of toughness” that already exists within the people of his ward. “We’ve got to tap the talent that’s still in North Minneapolis, whether it be small business talent, entrepreneurial talent, a creative talent, and generate our economy from there,” Ellison said. It frustrates Ellison when Northsiders grow up and feel like they have to move to a different part of the city because there [are] no jobs in North Minneapolis. “We’ve got to stop the brain drain that occurs with some of these really smart, tough folks that grow up over North and end up leaving,” Ellison said. Economic mobility for Northsiders will lead to positive change in other aspects as well, Ellison said. He knows that there are violence and drug problems in his ward, and he said it is critical to provide new and creative ways to address those issues. “We’ve tried to arrest away homelessness. It didn’t work. We tried to arrest away drug use. It didn’t work. We tried to arrest away drug selling. It didn’t work. You’ve got to be able to create some alternative options for people,” Ellison explained. Another thing that Ellison wants to focus on during his four-year term is making himself accessible and accountable to his constituents, and it’s hard to have one without the other, he said. Ellison said he plans on working from a coffee shop in his ward once a week, holding monthly events and larger quarterly town hall study session-type events. Both of Ellison’s parents have run successful campaigns for elected office. His dad, Keith Ellison, is a U.S. Representative for Minnesota’s fifth district and his mom, Kim Ellison, won a citywide school board election. Their path towards public service is something that Ellison internalized at a young age. “That interest in other people and improving other people’s lives was sort of baked in,” he said. Keith Schubert welcomes reader response to kschubert@spokesman-recorder.com.